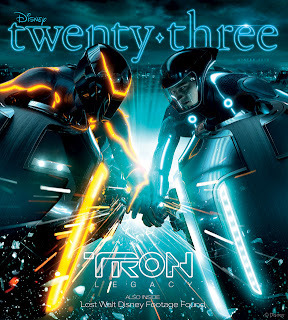 Cooking With Mickey: New Disney Twenty-Three Covers TRON:Legacy! 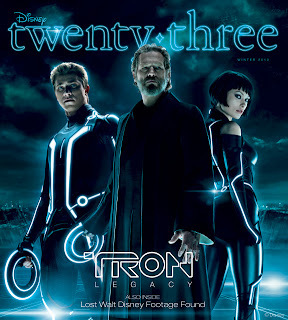 New Disney Twenty-Three Covers TRON:Legacy! Disney's D23, the official Disney fan club's quarterly magazine Disney twenty-three will be giving readers a sneak peak at TRON:Legacy. The Winter issue will be released on November 1, 2010 and will feature two different covers, one exclusive to Disney twenty-three members and another for those who purchase from Barnes & Noble, Borders, the Disney Store, Walt Disney World or Disneyland (retail price $15.95). In the issue you will find in-depth discussions with Director Joseph Kosinski, Producer Sean Baily, Writer Steven Lisberger and Actors Bruce Boxleitner and Garrett Hedlund. You'll find out why there is such a gap between the original TRON and TRON: Legacy, behind-the-scenes moments, and more. After seeing the two different covers I'm looking forward to my Disney twenty-three Winter issue arriving, as well as picking up the one for those who aren't. After seeing these and knowing there is a special TRON gift... I'd say now is the time to become a D23 member! Visit www.disney.com/D23 to become a member today! Also included in this issue will be a look at Aulani Resort and Spa in Hawaii (packed with photos), a look at the career of Disney Legend Dave Smith (founder of the Walt Disney Archives), the holiday season through the eyes of Walt Disney and his family, a look at the last time Walt was in front of the camera, 23 Questions with Disney Legend Alice Davis, D Society (including George Lucas talk) and much more. For more information of Disney D23 and membership visit www.disney.com/D23! I am looking forward to this issue. I actually just finished the last issue that came.